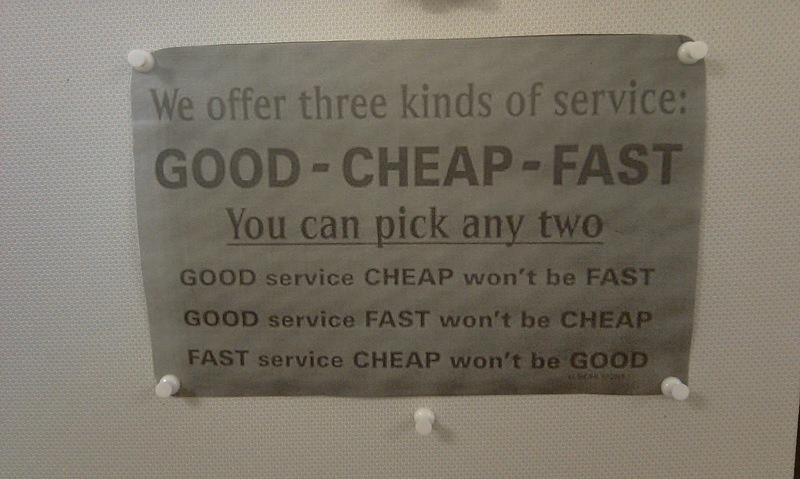 Quality, Cost or Schedule? Pick One! This sign is posted in the purchasing department of a large hospital in Pennsylvania. While one would assume it is intended to be humorous, does it not convey the choice we as customers so many times face? 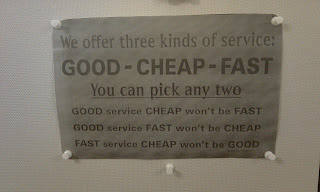 Why must a customer make a choice between Quality, Cost, and Schedule? If the job is done right the first time, it can stay within budget and meet schedule. It is when the job is not done right the first time, that it costs more because it has to be done over and the schedule is delayed because the “redo” takes extra time. The key is to establish clear requirements between customer and supplier and then make sure the process is capable of delivering those requirements 100% of the time. Too often, the low bidder wins the contract, but does not have the process in place to deliver what was promised. When that occurs, we have what is seen in the sign above!